You may not think this intense craving for Lay's potato chips and Prosecco could be conjured by the desert-driven thirst of West Texas. I'd maintain that the comestible combo is a perfect and symbiotic relationship. One that reflects the essence of minimalist-inspired art kids stomping the back streets of Marfa. 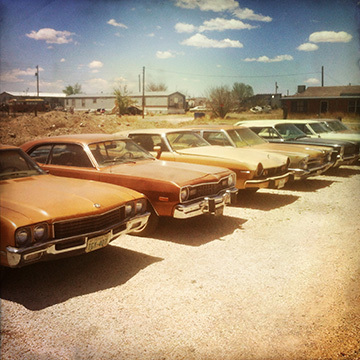 Here, statues of vintage muscle cars stand all tattered and betwixt prickly pear and tumbleweed. Towering spires and incense. Temple bells and dancing votive flames. 'Tis not the blessed or sacred space that is required for contemplation. Clanking of rocking, swaying boat masts. Warm breath of grassy fields. 'Tis neither foreign nor familiar place that is required for meditation. We need not panoply and religiosity, not even a stone labyrinth leafed in gold. 'Tis any new or worn journey or even standing still that induces reverie.